Commercial Garage Doors - The Wright Door Co. The Wright Door Co. offers several great industrial garage doors for commercial use. We have been in the industry for decades and know what to look for in a great door. All of our commercial garage doors are strong, built to last, and look great. 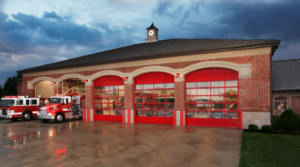 Whether you are looking for a simple economy door, an insulated door, a firehouse door, or other options, we would love to talk with you about how we can help. The doors we sell and install are all made in the United States by companies we trust. Our installation and repair technicians are well-trained and knowledgeable about each brand and every issue. Along with garage door installation, we offer inspections, maintenance plans to keep your operating well and prevent problems to keep long-term costs down, and 24/7/365 emergency service. We also install new garage door openers and offer repair services for existing doors, openers, springs, and components. See below for our selection of high-quality garage doors, and contact us today to chat about getting one installed!